It’s Sunday at seven. The shadows are getting long and we have food on our minds with no options left in the cooler beyond some crackers and dried apricots. We are heading south toward Grand Rapids enjoying the two lane portion of 131 south and all it’s eccentricities…the concrete statuary, the tree filled with shoes…and feeling that feeling that comes when a weekend is drawing to a close and the next week lies ahead. August in Michigan is heavenly. It is deep summer, the fields are dusted with flowers, vegetable stands overflowing with corn crop up in front of farm homes, the hay is being baled in the fields. The days are hot, the nights are cool, and you begin to see the random tree already starting to turn colors, an unwelcome reminder that this won’t last forever. This summer has been full of music, friends, and food. I’ve been so fortunate to be able to travel around with Drew on some weekends for his festival concerts and house concerts. It’s been an exciting journey and I’m so lucky to be able to hear some of Michigan’s finest musicians on a regular basis. 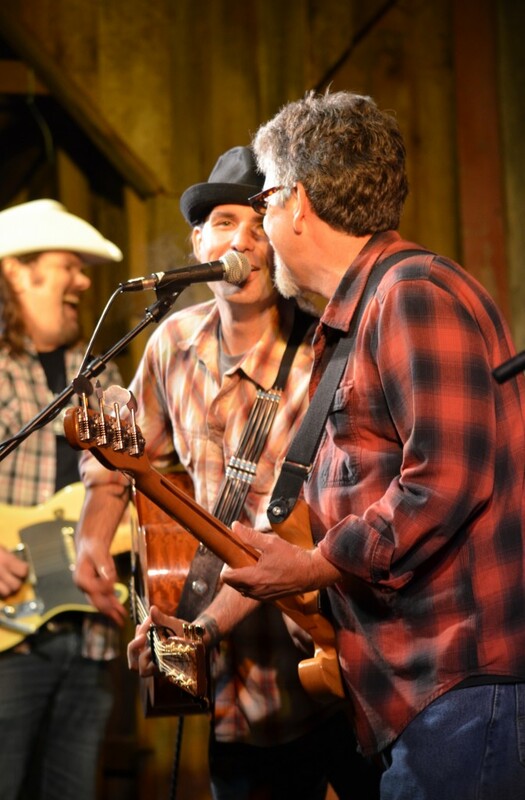 We are heading home from FarmFest, where Drew played two tight concerts with his band. We didn’t spend much time there but the setting was beautiful and the stage was one of the coolest I have seen. The festival is held on the grounds of an organic farm east of Gaylord, MI. It is a quaint festival with two stages and tents and various vendors dotting the woods that surround the main fields. After walking past a booth full of tie dye for sale, chioga beets popped into my head. Chioga beets (a.k.a. candycane beets) are the tie dye of the vegetable world. Visually, it is one of my favorite vegetables and the taste is hard to beat too. 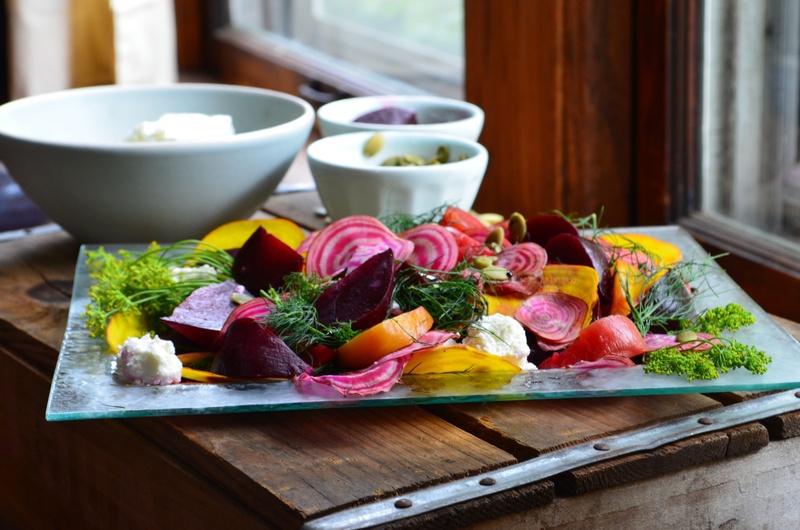 A milder beet, they fall in between yellow beets and red beets in flavor and look gorgeous mixed with their other-colored siblings, some dill, and goat cheese. A couple of weeks ago I had a photo shoot with the Grand Rapids Magazine. They plan to have an article about Dinner With Aura in their October issue. I was asked to have a dish photo-ready so created this vibrant and flavorful salad (thanks for the suggestion, honey! 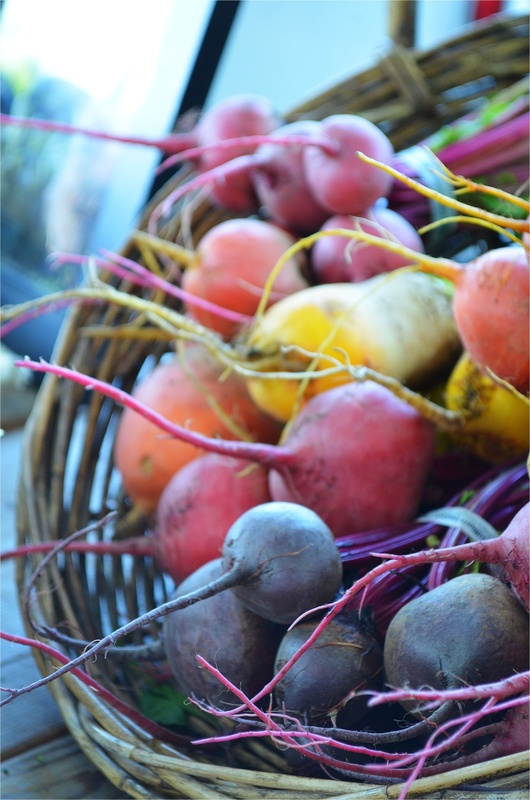 ), experimenting with the beets to find the best way to showcase their color and flavor. Some of the beets in this recipe are whole-roasted and some are shaved raw. To capture the brilliant color of the chioga beets as shown in the photos, you must shave them raw with a mandoline slicer (never, ever use a banjo, says my ever-wisecracking banjo-picking boyfriend….haha) or with a sharp vegetable peeler so you can see the beautiful patterns and can eat the beets with no trouble despite them being uncooked. Beets are also marvelous grated raw into a green salad and tossed with a vinaigrette. Experiment as you wish with the basic elements of this salad: beets, mild feta, fresh dill, honey-balsamic glaze, and raw pumpkin seeds. You can’t go wrong. Heat oven to 400. Remove beet greens and scrub beets but do not peel. Put one of each color beet in a small to medium covered baking dish (or use tin foil to cover if you do not have a covered dish). Drizzle with olive oil and sprinkle generously with sea salt. Roast until you can pierce the beets with a fork, about 1 hour. Let beets rest in the baking dish until cool enough to handle. In the meantime, heat honey and vinegar in a small saucepan. Bring to a boil and quickly reduce heat to low. Let simmer until the mixture reduces into a glaze, about 15-20 minutes. After what is called for in this recipe, you will have plenty left over for other dishes–this will keep for weeks in the fridge. At this point, if your beets are cool you can remove the skins. The beets will slip right out of their skins if you pinch them! Once all of the beets have been skinned, stand each beet on its head and cut into wedges, about 1/2 inch thick on the outside. Keep the yellow and pink beets separate from the red beets to avoid staining. 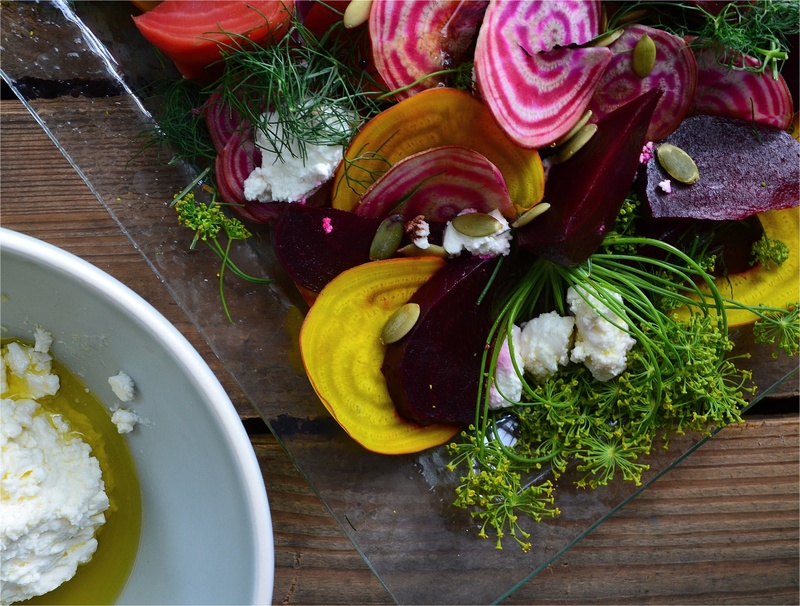 Toss the yellow and pink beets with the dill and feta. Arrange red beets amongst the others. 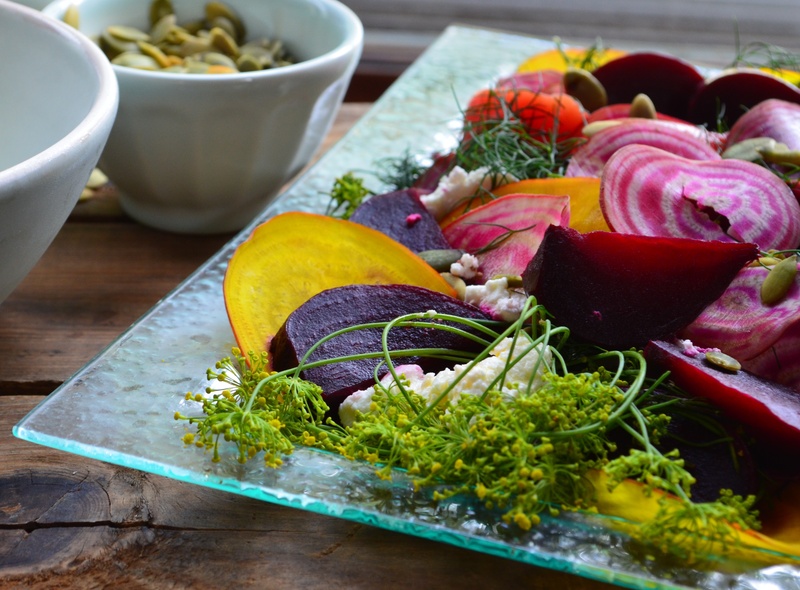 Shave several slices of chioga beets and arrange around the plate. Sprinkle with pepitas and drizzle lightly with honey-balsamic glaze. This can be served at room temperature or cold. Will keep for a few days in the fridge.